Plum District has a fun daily deal right now – get $50 to HauteLook.com for $25. HauteLook.com is a flash sale site with up to 75% off name brand clothing, toys, beauty products, accessories and even the best travel getaways. Right now they are featuring “First Look: Stocking Stuffers” it’s full of idea for Christmas stockings. 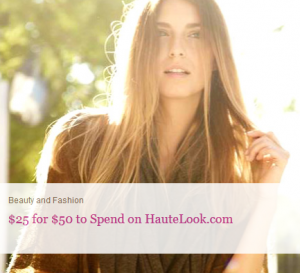 Unlike past daily deals, this voucher can be bought by all Hautelook customers, new and old.